We Have Finally Reached 60! Rejoice! 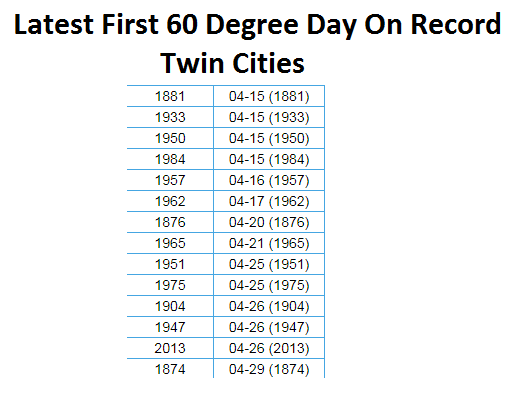 On Saturday, we finally reached 60 for the first time since November 27th here in the Twin Cities. That means we went 144 days in between 60 degree readings. I think we can finally start to say winter is over. 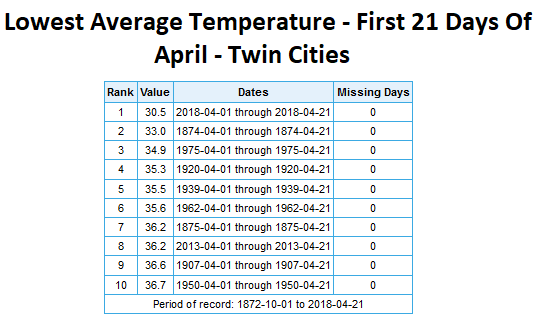 This marks a tie for the 7th latest first 60 on record for the Twin Cities, but that was still earlier than what we saw in 2013 when we didn't hit 60 for the first time until April 26th. 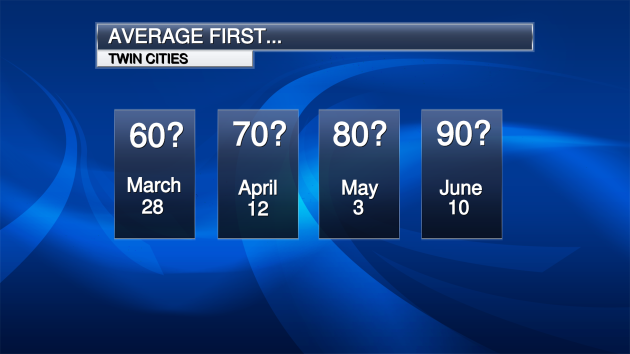 As we take a look at when we typically see our first 60, 70, 80 and 90 degree day in the Twin Cities, we are certainly already behind in the first 60 and 70 degree day category. We shall have to wait and see how close our first 80 and 90 degree days end up behind at least close to average over the next several weeks. Well, it should be somewhat obvious that we are below average so far this month in the temperature department when we have only hit 50 six times through Saturday and finally reached 60 Saturday for the first time. However, the average temperature so far this month continues to be at record levels for the first 21 days of the month (through Saturday) - a good 14.7 degrees below average so far. 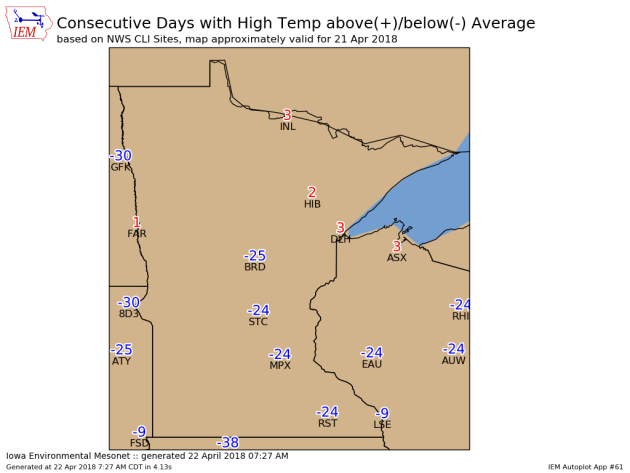 Through Saturday, we had gone 24 straight days with a below average high in the Twin Cities and St. Cloud, as well as in various cities in Wisconsin. Meanwhile, parts of northern Minnesota including Duluth and International Falls have actually observed above average highs since Thursday. With the warmth (and recent heavy snow) comes the spring melt and, in some cases, the spring flooding. This was Sunday morning in southern Minnesota along the Rush River, where Highway 93 was closed due to flooding. 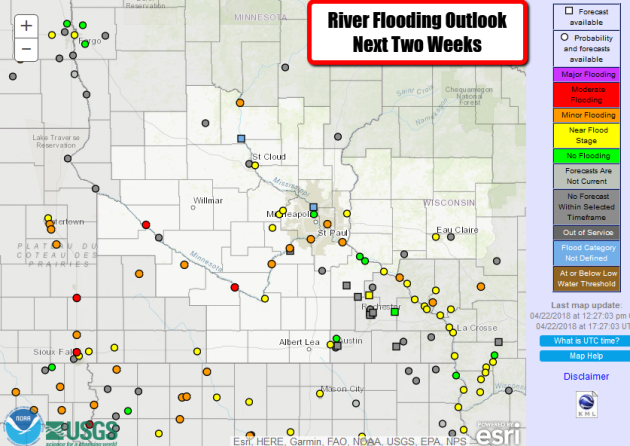 The potential of river flooding will only grow as we head through the week, with some rivers - including the Mississippi and Minnesota - having the potential to reach at least minor flood stage in areas. Parts of the Minnesota and Cottonwood Rivers could reach moderate flood stage. 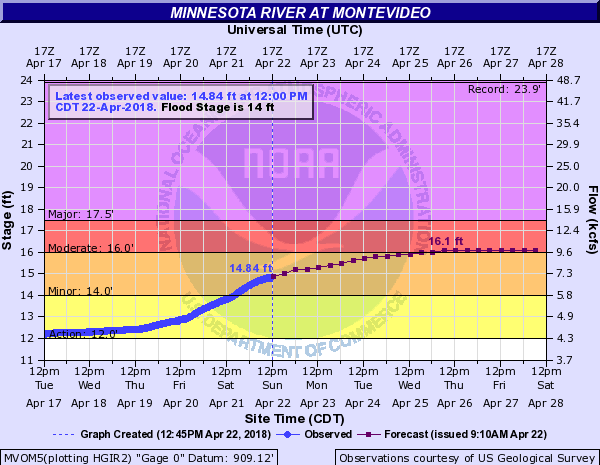 This is the projection for the Minnesota River at Montevideo. The river was already at minor flood stage Sunday, and is expected to reach moderate flood stage Wednesday evening. According to NOAA, at 14 feet, "Low lying areas and some roads along the river begin flooding, along with some basements of houses along the river" and at 17 feet, "Storm sewers may need to be plugged to prevent water from backing up into streets." Spring has certainly sprung across the region over the past few days, as Old Man Winter finally loses his grip on the upper Midwest. Highs have climbed into the 60s, and the snow is melting away. Speaking of snow melt, what snow fell with our recent blizzard has quickly fizzled away across the region. Last Monday there was 11” of snow on the ground, but as of early Sunday that was down to a trace. Now we are left with mainly giant snow piles in parking lots as a reminder of the largest April snowstorm in Twin Cities history. If we can make it to at least 65 today, it’ll be the first time in the Twin Cities since October 21 - over six months ago. Highs will remain in the 50s and 60s this week, with only a few slight rain shower chances. Spring weather has taken its time to make it to Minnesota this year, and hopefully it was worth the wait. If spring is your season, make sure to get out and enjoy the bug-free weather while it lasts, as it won’t be long until summer is here and we’re all swatting away mosquitoes. MONDAY: Sunny and warm! High 68. Low 44. Chance of precipitation 0%. Wind S 3-8 mph. TUESDAY: Cloudy. Slight PM rain chance. High 60. Low 35. Chance of precipitation 20%. Wind N 5-10 mph. WEDNESDAY: Mainly sunny. A few late day clouds. High 58. Low 41. Chance of precipitation 0%. Wind NE 3-8 mph. THURSDAY: Scattered showers. Breezy winds. High 57. Low 35. Chance of precipitation 30%. Wind NW 10-20 mph. FRIDAY: Another sunny day. Slightly cooler. High 54. Low 38. Chance of precipitation 0%. Wind N 10-15 mph. SATURDAY: Bright Saturday sunshine. High 61. Low 42. Chance of precipitation 0%. Wind SW 3-8 mph. SUNDAY: Mix of clouds and sun. High 63. Low 41. Chance of precipitation 10%. Wind SW 5-10 mph. 1990: A record high of 88 degrees is set at Redwood Falls. 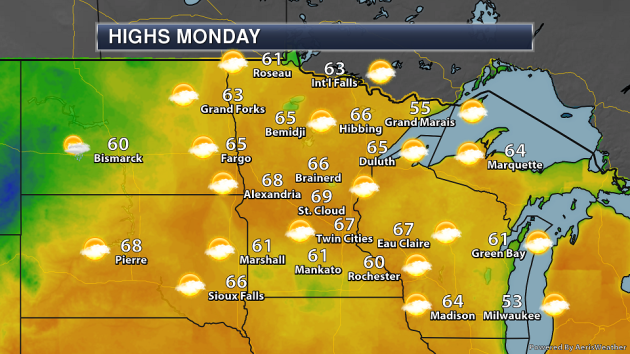 A spectacular Monday is ahead across the state, with highs climbing into the 60s in many areas - and there is even the potential of a few 70s across parts of central Minnesota. Some areas of southern Minnesota where there is still snow on the ground and parts of the North Shore will stay in the 50s for highs. 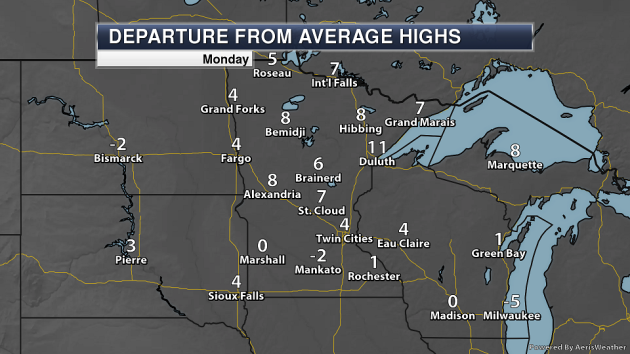 For the most part, highs across central and southern Minnesota will be a good 5-10 degrees above average for this time of year. 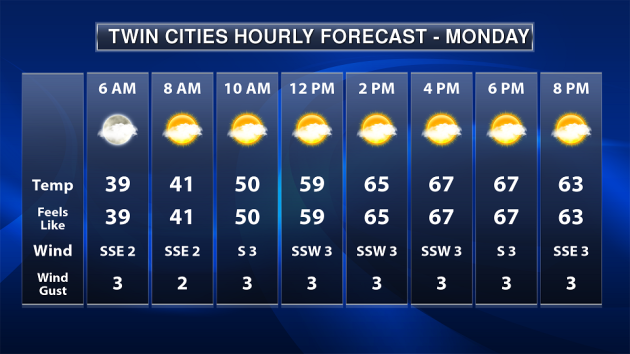 As we take a look at the hourly forecast for the Twin Cities Monday, we'll start off in the 30s but quickly climb into the 60s by the early afternoon hours. Winds will be fairly light throughout the day. A couple systems moving through the region this week - one on Tuesday, another Thursday - will help to knock back temperatures this week, but we should remain in the 50s and 60s for highs over the next seven days. The long term outlook even has the potential of temperatures reaching or topping 70s by the end of the month or to begin May. Those couple storm systems moving through the region this week will bring light rain chances along with them. The best chance of accumulating rain looks to be on Thursday at the moment. We'll be watching a couple systems across the country on Monday. The first will bring rain and thunderstorms from the Ohio Valley into the Mid-Atlantic and Southeast as a center of low pressure move through the south. A second will bring rain and higher elevation snow across the Northern and Central Rockies into the Northern Plains. 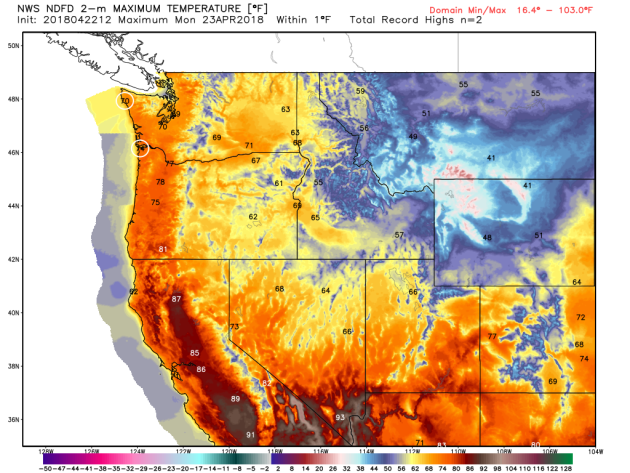 We could even see a few record highs in places like Astoria, OR, and Quillayute, WA, Monday. Heavy rain will continue across portions of the Southeast and Mid-Atlantic Monday into Tuesday, with another round of (lighter) rain possible for the second half of the week. An inch or more of rain will be possible across the Plains this week as well, while many areas of the west remain dry. More from VOX: "You may have heard that last year’s allergy season was the worst ever. And so was the year before. Allergy season has become so predictably terrible that late-night comedians have taken to venting about warnings of the “pollen tsunami” ad “pollen vortex” or a “perfect storm for allergies.” It turns out there’s truth behind the bombast. The number of people with allergies is increasing, for a variety of reasons. 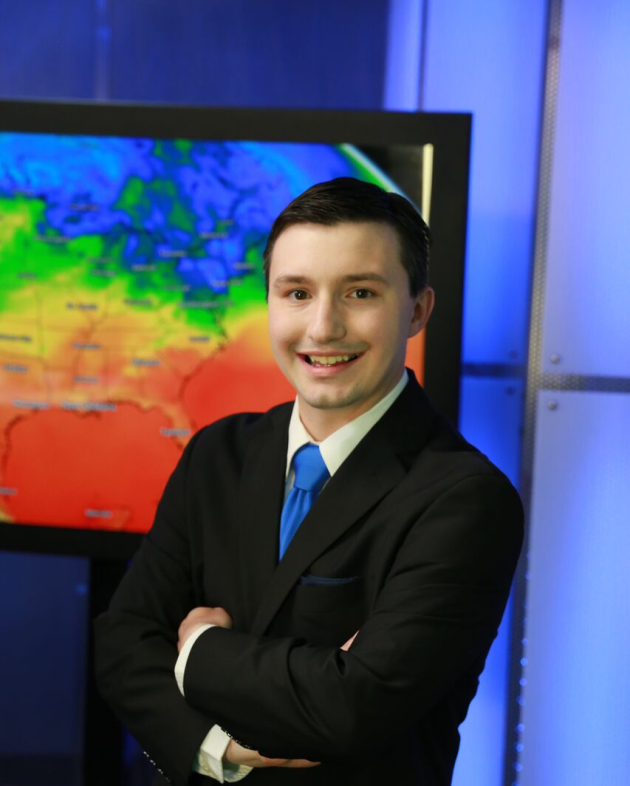 And one key factor is global warming, which is linked to higher concentrations of pollen in the air and longer allergy seasons." Happy Earth Day! Second 60 Degree High of 2018?